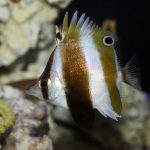 The phenomenal Twilight Zone: Deep Reefs Revealed exhibit at the California Academy of Sciences is legendary among aquarists for all the rare marinelife it has on display. There’s nowhere else that you’ll find Roa rumsfeldi, Sacura speciosa and Lyrocteis imperatoris all in the same room, and their stellar collection is about to grow even more impressive thanks to some exciting new acquisitions. Back in August, a team of researchers led by the Academy’s Bart Shepherd and Luiz Rocha, along with famed mesophotic explorer Brian Greene, set off to explore the depths of Micronesia. This was a follow-up to an earlier trip back in 2015 that first documented the presence of several interesting new species in the region. 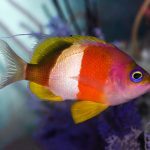 The fish seen above is one of these known unknowns. 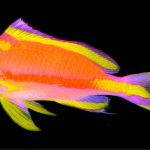 It belongs to the small anthias genus Tosanoides, a group that includes just three described species (including one famously named after Barack Obama), all of which are restricted to the very deepest coral reefs. In the video below, you can see if briefly as it swims about in this habitat. Dr. Sonia J. Rowley ends her presentation at MACNA 2015 with a compilation of Twilight Zone clips from Pohnpei, Ant Atoll and Pakin Atoll, in the Federated States of Micronesia. Join Sonia, Richard L. Pyle and Brian D. Greene on a journey into the unknown – footage taken by all three team members and compiled by Sonia J. This new Tosanoides was encountered at Pohnpei in depths of 460 feet—five were collected, and three are currently on display. The species possesses an interesting mix of traits found elsewhere in the genus. The striped patterning is very much like that seen in T. flavofasciatus (known from Japan & Tonga), but with some obvious differences, while the shape of the dorsal and caudal fins show more of an affinity with T. obama (from Hawaii) and T. filamentosus (from Japan). 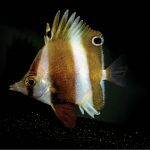 Meanwhile, another spectacular deep sea rarity just made its debut, the incomparable Cephalopholis igarashiensis. 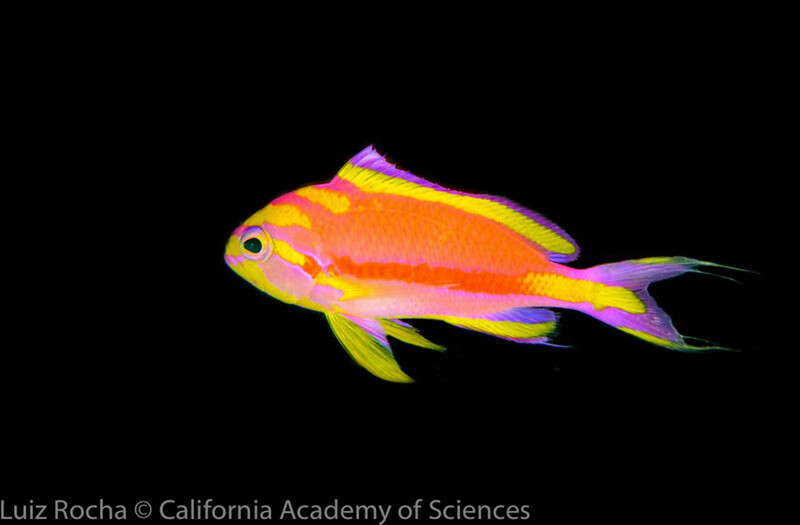 Aquarists know this fish as the Neptune Grouper, but you’ll also see it referred to as the Garish Hind or the Goldbar Grouper, which should give some idea for how flamboyant this species gets. 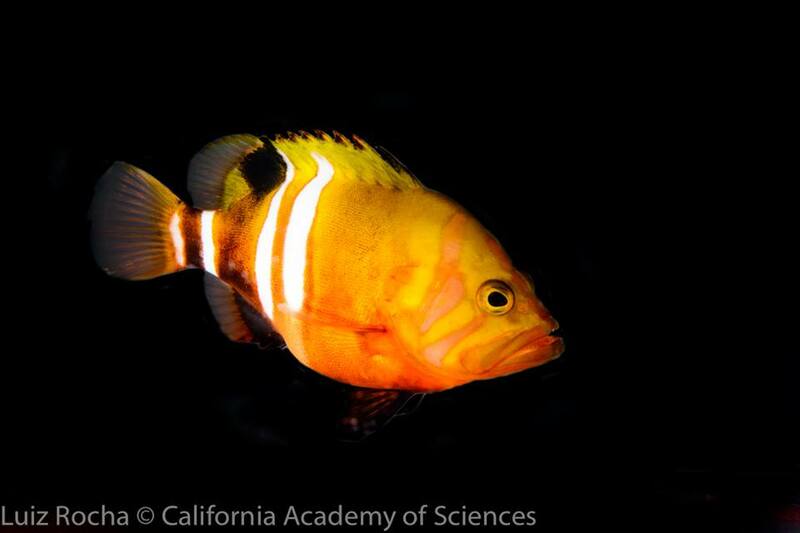 The specimen collected for the Cal Academy is still a juvenile, possessing the characteristic black fin markings of this species’ youth. With age, additional white bars will develop, while the dingier portions of the body slowly brighten to a vibrant shade of red. 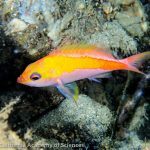 The end result is one of the ocean’s living jewels, a fish of profound beauty that few are ever lucky enough to see alive in its natural habitat.